Radlett is a community within the historic Parish of Aldenham which has been created almost entirely within the last hundred years or so. Despite its position astride the ancient highway of Watling Street, the thickly wooded land adjoining this seems to have been ignored for settlement as travellers, from pre-Roman times onwards, hurried along the street on their way from London to St Albans. Only a lone potter operating locally in the third century gives any clue to human occupation before the Middle Ages. The name of Radlett appears to have evolved from the Old-English rad-gelaete meaning a junction of roads, and it is clear that the original small nucleus grew at the point where the old route from Aldenham to Shenley crosses Watling Street – still the heart of the village today. The first recorded reference to ‘Radelet’ comes from 1453, and the first listing in parish registers appeared in 1560. A painting of 1796 shows a still very small cluster of farm buildings and an inn. At least one of the two inns at the cross-roads, the Cross Keys (now Prezzo restaurant) and the Red Lion, must have existed for a long time, but there are no firm records concerning either before the end of the 18th century. During the 19th century, the large estates which flanked Watling Street locally – Kendals, Newberries and Aldenham Lodge: each with a mansion at its heart – came to maturity, and their owners enjoyed all the privileges of landed English gentlemen, renting parts of their lands to tenant farmers, and acting as squires in the local community. For most of the 19th century, dwellings in the area around Radlett were mainly limited to those which were necessary to support the running of the estates. The distinctive Flint Cottages facing the Red Lion hotel are surviving buildings of this type. They were erected by the Phillimore family in 1852 to replace a mass of derelict earlier farm buildings. In the 1860s the Midland Railway main line was extended southwards from Bedford into London, running locally through the valley of the Tykeswater stream. A fully-equipped station was built at Radlett to serve the surrounding catchment area, even though local passenger traffic was minimal. The activity associated with the station – including mineral workings on Shenley Hill, for which a network of service tramlines running into the station marshalling yards was constructed – generated a sufficient population in the neighbourhood to warrant the building of a church, on land donated by the Phillimore family of Kendal Hall, with financial support from the other land-owners. Hitherto, church-goers had had to make their way on foot or horseback to the parish church at Aldenham. 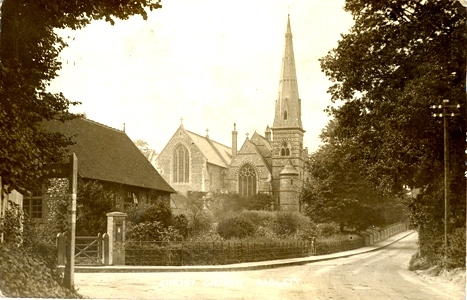 Christ Church was built in 1864 as a District Chapelry to serve Radlett and the neighbouring area of Cobden Hill. On 8 December 1865, the Ecclesiastical Parish of Radlett was created out of the eastern part of Aldenham; marking the start of the modern history of the village. Despite the existence of the railway service and the parish church, however, growth in the succeeding years was slow. The first shop in the village was built as a co-operative society called the Radlett Stores in 1883 by Mr Charles Part, owner of Aldenham Lodge, on land he owned near the station (on the site of the present Barclays Bank). Mr Part also donated the land for the adjoining Radlett Garden, and for the village hall, built in commemoration of Queen Victoria’s diamond jubilee. A boys’ school to serve both Elstree and Radlett was built, midway between the two villages, at Medburn in 1864, and a girls’ school opened in a building now falling into disrepair at the junction of Loom Lane and Watling Street in 1878. Both schools were financed by the Platt Charity of the Brewers Company who were trustees of the long-established grammar, later public, Aldenham School. 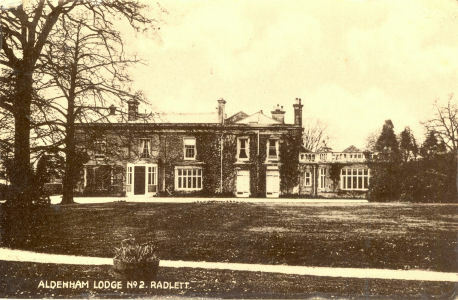 It was in the last decade of the nineteenth century that the development of Radlett started in earnest, when the landowners began to sell off plots near the village centre for building purposes. In 1902, the Radlett Stores was transferred to larger premises across the road, the original building becoming a bank and was later rebuilt. More shops were built in front of the railway station, and the terrace of cottages adjacent to the Railway Inn which had been rebuilt by William Brough Phillimore in 1882 was also converted into shops. In 1905, new shops filled the gap between the end of the terrace and the newly-built Congregational Church. Most of the east side of Watling Street remained undeveloped until much later. Although the rate of development between 1900 and 1914 was comparatively rapid – as the advantages of Radlett as a residential area were discovered – it was piecemeal. Many of the inhabitants were still employed locally on farms and estates, in numerous sand and gravel pits, and on the railway. It was not until after the First World War that the village began to acquire some of the characteristics of a commuter dormitory settlement. A new chapter was opened in 1935 by the sale of the Newberries Park estate for development; this had previously acted as a barrier to expansion east of Watling Street. However only a few houses had been erected before war broke out and the majority of the present estate was completed in the 1950s (when Newberries mansion was demolished) and 1960s. Also in the postwar period, the Batlers Green housing estate (started by the then Watford Rural District Council in the 1920s) was greatly enlarged; it was partially rebuilt and expanded in the 1980s. The Newberries Parade shopping centre was built in the 1950s and 1960s. The introduction of the Metropolitan Green Belt in the 1950s set a legal framework limiting further outward growth beyond the then existing limits of the settlement, and since then new development has been restricted to infilling within the built-up area. Despite this, many new houses continue to be built in former large gardens, and the population now stands at over 8,000.